It’s like Christmas morning for pedestrian advocates! This week’s New York Times Magazine is all about walking, from the very act of perambulation to all the ways that the city—any city really—is best appreciated on foot. And the cover is a street-scale work of art. This is not Photoshop! The art was shot practically, from a helicopter over one of the city’s many new pedestrian plazas, part of a hugely successful pilot program to give parts of major streets back to walkers. 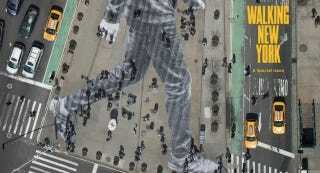 The giant pedestrian was made from strips of paper which were laid down on the ground, allowing the actual pedestrians to walk all over him. In fact, they didn’t even notice. There is a story about how RATS navigate the city on foot. Rat freeways! There’s lots more to to explore, so head over to the magazine’s site. Better yet, pick up a copy this weekend and take it on a stroll to the local coffee shop.